This combination of Colossal Red King Crab & Salmon gift pack offers the best of the best. Three pounds of Colossal Red King Crab & five pounds of wild Sockeye Salmon are wild caught and hand picked at sea for their size. Our sockeye salmon are troll caught to eliminate bruising. SKU: AFS0009. 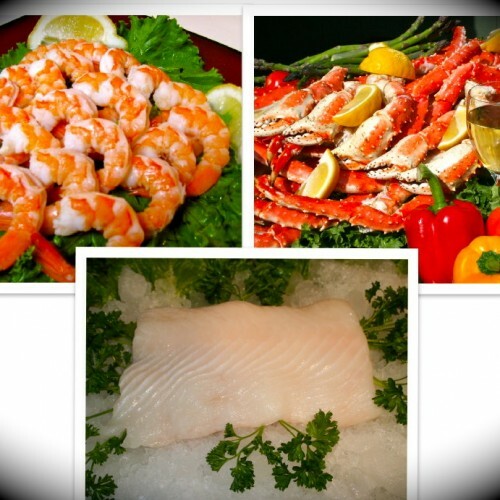 Categories: Alaskan King Crab, GIFT PACKS, Salmon. Our hand selected Colossal Red King Crab comes straight from the icy waters of Alaska’s Bering Sea. These are the Mac Daddy Colossal king crab legs. Nothing compares to the size or the taste! Each meaty leg is approximately ¾ to 1 lb. A true favorite of our crab connoisseurs and impressive at any house party! Easy to prepare and succulent! Alaskan Colossal Red King Crab & Salmon gift pack will make the ultimate gift for your family or friends! If you're entertaining, pick up the phone and dial 855-223-3323 (toll free). One of our courteous customer service representatives will be happy to accommodate all your needs. What's new with Bristol Bay Red King Crab! The King is Back! Alaska is famous for its red king crab. The fishery dates back to the 1930s when it was initially dominated by foreign fleets. U.S. fishermen started harvesting king crab in 1947. The U.S. fleet expanded in the late 1960s and took over in the 1970s, when the Magnuson-Stevens Act prohibited foreign fishing in U.S. waters. Catch in the Bering Sea peaked in 1980 at almost 130 million pounds, but the stock collapsed shortly thereafter. Catch subsequently dropped sharply in the early 1980s and remained low for the next 2 decades. Under several years of conservative harvest levels and innovative management, Bristol Bay red king crab has finally bounced back. According to the most recent estimates, mature females are almost 3 times more abundant than they were in 1985, and mature males are 2.2 times more abundant. Most of today’s red king crab harvest comes from Bristol Bay and represents one of the most valuable fisheries in the United States.